In most cases, the reactivity of carboxyloids involves converting one carboxyloid into another. This is done by replacing one heteroatom substituent with another. For example, the chloride in an acid chloride may be replaced by an alcohol or alkoxide ion to make an ester. The fact that one carboxyloid can be converted into another suggests that there would be an equilibrium between them. The ratio of two carboxyloids at equilibrium would be determined by their relative stability, as well as the stability of other associated species in solution. We can map out the stability of carboxyloids on a potential energy surface, as shown below. The higher energy, less stable, more reactive carboxyloids are shown at the top of the potential energy curve. The lower energy, more stable, less reactive carboxyloids are found lower down on the potential energy curve. Figure CX3.1. A potential energy curve showing relative reactivity of carboxloids. 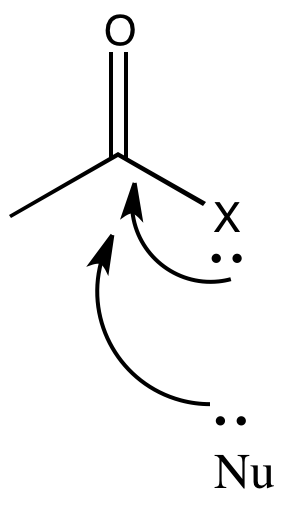 The heteroatom attached to the carbonyl in a carboxyloid is always an electronegative atom with a lone pair. Either of those two features might be useful in understanding the reactivity trend illustrated above. For example, an electronegative atom would make the carbonyl carbon more positive. That carbon is already very positive because of the double bond to oxygen. Adding an additional electronegative atom should make it even more so. The amount of positive charge on the carbonyl carbon would be even greater if the atom attached to it were exceptionally electronegative. On the other hand, a nearby lone pair might counteract the electron-attracting power of the carbonyl carbon. In a sense, we might think about that lone pair as competing with donation from a potential nucleophile. The ability of an atom to π-donate, then, might have an influence on how strongly the carbonyl will attract nucleophiles. Of course, there is some trade-off involved in π-donation. Usually the atom that donates must take on a positive charge, since it is lending a pair of its own electrons to another atom. Factors that influence how easily this may happen could be important in determining carboxyloid reactivity. Based on electronegativity of the atom attached to the carbonyl carbon, we might expect a specific trend in carboxyloid reactivity. Explain how this factor would affect electrophilicity at the carbonyl carbon and predict the corresponding trend in reactivity. Compare this trend with the information in Figure CX3.1. Lone pair donation from the atom attached to the carbonyl carbon could also influence carboxyloid reactivity. Explain how this factor would affect electrophilicity at the carbonyl carbon and predict the corresponding trend in reactivity. Compare this trend with the information in Figure CX3.1. Using the information in Figure CX3.1, explain why peptides (containing a number of amide bonds, R(C=O)N) are such a common structural feature in biology. The potential energy curve in Figure CX3.1 is a useful index for the interconversion of carboxyloids. In general, it is easy to go downhill on the curve, but more difficult to go uphill. That means that compounds lower down on the ski hill can be made easily from compounds farther up the ski hill. In general, pi donation from the heteroatom attached to the carbonyl is a primary factor that determines carboxyloid reactivity. The more able the heteroatom is to donate its pi electrons, the less electrophilic is the carbonyl. Nitrogen is very good at donating its lone pair. It is about the same size as the carbon atom it needs to donate to, and it only a little more electronegative than the carbon. Oxygen (in esters and carboxylic acids) is next in line, since oxygen is more electronegative than nitrogen. Chlorine and sulfur are a little too large to donate very well to a carbon atom. The size and energy mismatch between these atoms leads to poor pi bonding, and poor pi donation.